Statistician and political blogger Nate Silver appeared last night before a packed auditorium to talk about the role of statistics in elections and politics, as well as his own career. Silver’s fame skyrocketed late last year when his application of statistical techniques to polling data correctly predicted the outcome of the presidential vote in all 50 states (and the District of Columbia). The recent announcement of Macklemore & Ryan Lewis as the headliners for this year’s SpringFest spread like wildfire across the MIT campus. In addition to the concert, the Undergraduate Association (UA) Events Committee is working to make SpringFest, previously known as Spring Weekend, bigger and better than ever before. 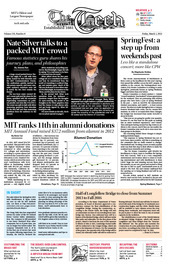 In 2012, MIT raised $34,795 per student. This puts MIT as the 11th highest fundraiser when compared to other reporting U.S. colleges and universities, according to a press release last week from the Council for Aid to Education (CAE). Stanford University, which received the most total contributions with $1.03 billion in fundraising, ranked fifth with $55,745 per student. Yale University, California Institute of Technology, Princeton University, and Harvard University ranked 7th, 8th, 17th, and 18th, respectively. According to the Mass. Department of Transportation, its board of directors approved a construction contract for final rehabilitation of the Longfellow Bridge. During the construction, according to the Boston Globe, the bridge will only accommodate one lane of cars traveling from Cambridge into Boston. One outbound lane will be a feature of the finished bridge, which will have wider bike paths and sidewalks. For the first phase of the project, slated to last from the start of this summer to Winter of 2014 or 2015, Cambridge-bound traffic will be redirected to the Craigie Bridge, which sits next to the Museum of Science. For the remainder of the project, the opposite side of the bridge will be closed, but vehicular traffic will still be restricted to flowing inbound. The Red Line will also be truncated at both ends of the bridge for 25 weekends once construction begins, said the Globe. Shuttle buses will be available to carry citizens across the river during these weekends, and temporary track will be put in place to allow the train to run at normal capacity on the weekdays.